SOUNDCREST DPA240A is a High End 2-IN/4-OUT digital speaker management system which maintains the same high quality hardware present in former QRT versions. Designed for maximum versatility, it provides all the processing and control necessary for both live and fixed installation use. 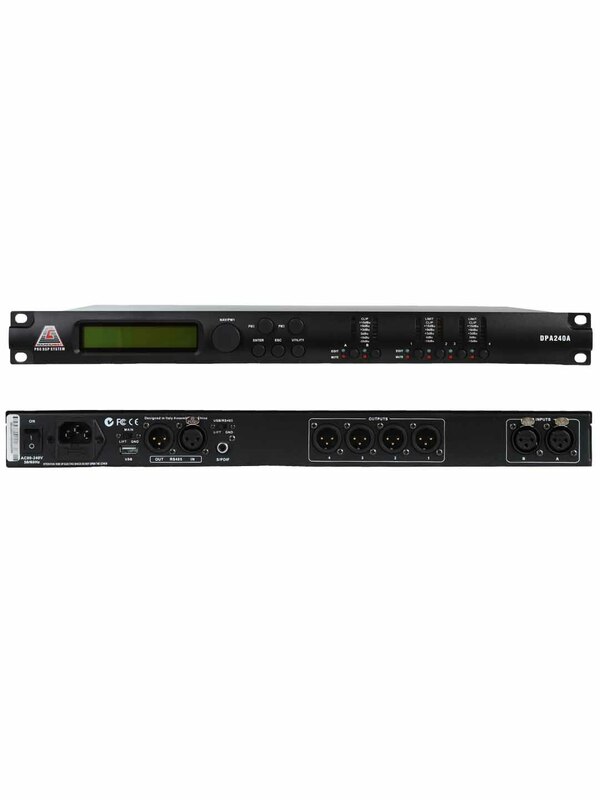 Proving for any crossover configuration, it offers 2 analog inputs, 4 analog outputs and a digital S/PDIF input, managed by a powerful DSP Engine, for a full 96kHz processing, in addition to high performance 24 bit AD/DA Converters. Each input channel provides a choice of EQ with 30-band Parametric EQ, 3 ALL PASS Filter, Gain control, Noise Gate, RMS Compressor, and configurable Delay.Each output offers up to 7-band of parametric equalization, in addition to the crossover filters which themselves provide slopes from 6dB/Octave up to 48dB/Octave. Each output path also features Peak Limiter and configurable Delay. The DPA240A supports a full matrix mixing mode where inputs may be routed/mixed in any ratio to any output. For remote configuration and control the DPA240A can be connected via USB or RS485 connections. The control remote PC software allows simultaneous control up to 32 units, setting all parameters and showing real time levels.